Beauty and The Beast came out so long ago now, but I am still completely obsessing over it. I realised I never shared my thoughts on the film here, so I decided now would be the perfect time, because I'm hoping that most people have seen it by now and the risk of me being the fucker who accidentally ruins it for somebody is low. How stunning was this film though? The cinematography and the CGI was absolutely spot on in my opinion, I was a bit concerned that it would be a bit over the top and it would look way to superimposed, but I thought they got the balance just right. The 'Be Our Guest' scene was so beautiful to look at I nearly forgot to appreciate the song (which was also fabulous.) I thought the costumes were absolutely stunning - that yellow dress! Oh my goodness, what a thing of beauty (aha) I'm so glad they didn't try to mimic the animated dress, and instead brought it to life in it's own way. 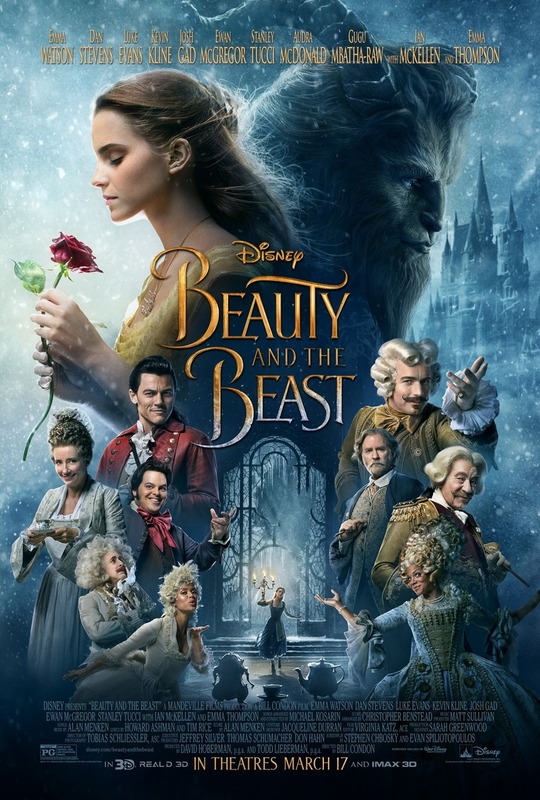 When you think of Beauty & The Beast, one of the first things that comes to mind is the songs, I must admit I was nervous that they were adding new songs in and whether or not they would do the original songs justice, and in my opinion they did. As soon as I heard the intro to 'Belle' I burst in to tears, so much nostalgia. As I mentioned briefly before I thought 'Be Our Guest' was perfect, I loved 'Gaston' - bravo Josh Gad, and I don't even know how to begin to describe how I felt about 'Evermore.' That song is so beautiful, I cried numerous times. I thought it fit so well with the theme of the film, and if that song doesn't win the Oscar next year then I will be severely disappointed. I actually really liked that we got a bit of backstory into The Beast & Belle's pasts, I know that has been a bit of a controversial decision to some people, but I thought it gave the characters a bit more context and helped to cement it more as a stand alone film. The casting for this film was impeccable in my opinion. Dan Stevens as The Beast was perfect, so sarcastic and funny, and really gave the beast an actual human side with a personality and had just the right amount of character development, the change in his demeanor felt realistic and not rushed at all. Also, that growl at the end. Swoon! I loved Ian Mckellen & Ewan McGregor as Cogsworth & Lumiere respectively. They were the perfect double act, nearly as good as the original's. Emma Thompson had some big shoes to fill, but I really loved her take on Mrs Potts and her rendition of 'Beauty and The Beast' was beautiful. One of the stand out characters for me was Le Fou. I loved what they did with his character, how he had real character development, becoming more and more uncomfortable with Gaston's actions and eventually showing himself to be a goody. I was so happy when Disney announced that Le Fou would be openly gay, and I feel like they did it in such a tasteful way. I'm also so happy he got a happy ending. There really wasn't that much that I didn't like, there were a few plot holes here and there, and some moments that I felt were unnecessary. My major issue with the film - and it's a really petty issue - why were the 'bimbettes' (the girls pining after Gaston) not blonde?! That's their trademark look, I feel like the point of them is that they are percieved as being SO different from Belle. Making them brunette had them sort of blend in with her and I didn't like it. I feel like I might get some stick for this opinion but... I wasn't a massive fan of Maurice. I thought the actor did a really good job, and I see what they were trying to do with him, I just wasn't drawn in by his character. I was so pleasantly surprised by Dan Stevens and Luke Evans' singing voices. Damn, those fellas can hit some notes. I had major heart eyes during their musical numbers. Emma Watson was a surprise for me, I really didn't rate the decision to cast her, but I was pleasantly surprised by her performance. Her singing was a bit hit and miss, but I actually really enjoyed her take on Belle and I can tell that a lot of young children being introduced to this version of the story will really relate to her. I also made a video talking more about what I thought about the film, it's slightly rambley as I filmed it the day after I'd seen it, so I was still full of excitement. I haven't seen the film yet and that's probably partly because I'm a fan of the animation and I'm a bit nervous to watch the live action version incase it ruins the original for me!